The great castles of England have played an important role in the economic, military, and social development of the nation. English castles, like their counterparts in Wales, are great monuments to England’s long history. For centuries, these grand structures have graced Great Britain with their imposing stone features and large aristocratic and royal estates. Many of the oldest castles in England date back to the Norman invasion in 1066. In the centuries following the Norman invasion, castles in England continued to grow in sophistication and comfort. By the 14th century, English castles not only provided superior defensive features, but they also boasted sophisticated, luxurious living arrangements, and beautifully landscaped formal gardens and parks. Throughout the Renaissance Era, a small number of castles were built for the wealthy to enjoy extravagant feasts and grand celebrations. During the 17th century, widespread religious and civil conflicts meant that castles, and the defense that they offered England, played an important role in protecting the nation’s interest. Today, the great castles of England pay homage to the past. The noble structures stand erect as a living memorial to the centuries that have passed, the battles that have been fought, and the people that have come before. Take a look at some of the most monumental castles in England and learn about the rich history of these awe-inspiring structures. The most iconic and oldest fort in England, Dover Castle has, even in recent history, played a vital role in the country’s defense against foreign powers. Originally, the castle was fortified by William the Conqueror in 1066. Prior to the fortifications, the site was a stronghold for Anglo-Saxon forces. Over the years, the fort was improved upon by several great kings, including Henry II and Henry VIII. Today, visitors to the white cliffs of Dover are able to uncover the secret tunnels, become immersed in its medieval interiors, or climb the Great Tower. This 800-year-old castle is best known for its connection to the legendary King Arthur and his Knights of the Round Table. Originally built by the Earl of Cornwall, brother to the then King of England. The Earl built the castle to resemble King Arthur’s infamous court at Camelot. Today, the castle is the site to many Arthurian re-enactments and mock battles. Every summer, the castle becomes the home of thousands of Arthurian enthusiast who come to experience the days of King Arthur and his knights. 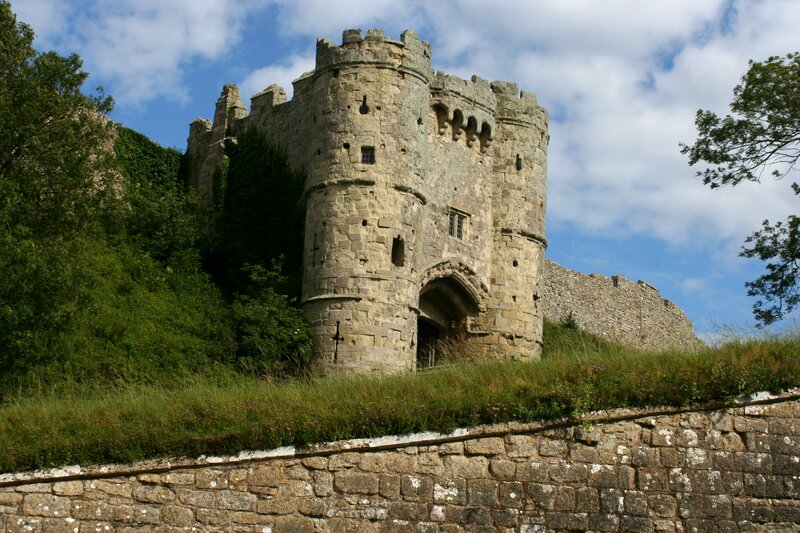 At the heart of the Isle of Wight is the romantic castle of Carisbrooke. The glorious castle has been many things over its long history. Once an armed fortress, the castle has also been a king’s prison and a royal summer retreat. Today, visitors to the majestic castle find an entertaining museum, a lovely Edwardian garden, and many wonderful events. Originally built in the 12th century, Bolsover Castle was given a makeover by Sir George Talbot in 1553 after years of neglect. The earl later became known for his marriage to ‘Bess of Hardwick’, who was probably the most astute business in the 16th century. Today, the castle intended for luxurious living has been restored. The castle’s battlements, venus garden, and fountain have been given a second life. Visitors are able to tour the grounds, visit the castle’s Discovery Centre (located in the castle’s riding stables), partake in one of the many events held throughout the year, or just enjoy a picnic at the lovely site. Just 30 miles from London, sits the 900-year-old iconic Leeds Castle. Once the home of Henry the VIII, the castle today is considered one of the most beautiful in England. With more than 500 acres of beautiful park landscape and formal gardens, the stunning site features breathtaking vistas that will entice you to return time and gain. 20 miles west of London, The 900-year-old Windsor Castle is the oldest official royal estate, and the largest currently occupied castle in the world. However, this residence is much more than just a castle. The grounds at Windsor contain a large church, several homes, and the royal palace. The 700-year-old Hever Castle was once the childhood home of Anne Boleyn is home to a fine collection of beautiful furniture, antiques, tapestries, and an impressive collection of Tudor paintings. Additionally, the castle is home to more than 125 acres of glorious gardens, and award-winning landscape. One thing is for sure, at any time of the year, the stunning castle’s exteriors and interiors are sure to take your breath away. Bolton Castle was once a defensive fortress as well as a luxurious family estate. Today, the castle is well-preserved home to many outstanding rooms and features and is one of the best castles in England to visit. Visitors of the castle can peruse rooms like the old kitchens, the nursery, the great chamber, Mary Queen of Scots’ bedroom, the armory, and even the dungeon. Stunning views of the Yorkshire Dales elevate the Richmond Castle into its rightful place as one of the most beloved attractions in North Yorkshire. Originally built to keep the peace in the unruly northern region, today, the castle is one of the most inspiring Norman fortresses in Great Britain. One of the most well-preserved and complete medieval castles in England, the 900-year-old Skipton Castle is a place where one can easily encounter remnants of the nation’s rich history around every corner. From the dungeon to the watchtower, Skipton Castle was made to last. In fact, the fortification, withstood a three-year log siege during the nation’s Civil War. As it stands now, the castle will be around for many years to come. The once majestic Corfe Castle now stands in ruins guarding the Purbeck marble quarry. At one time, nothing could pass forth from the rocky outcrop without first going past Corfe. The centuries-old hillside castle is the center of many stories of the kings and queens who passed between its walls. One of the most dramatic tales report that the castle is where King Edward was murdered by his stepmother in 979.
ilgrims have poured to the island’s jagged shores since the 5th century, when Micheal the archangel appeared before a group of people at the mount. The holy site was honoured, and a Benedictine monastery was built over the plat in the 12th century. Still today, true believers travel to the mount and follow in the footsteps of the ancient Pilgrims to the medieval monastery located at the top of the hill. The 900-year-old Norwich Castle is one of of Norwich’s most beloved landmarks. Originally built by the Normans as a royal palace, the castle was later used as a prison. Today, the castle is home to exquisite collections of fine art, antiques, and the collections of the Royal Norfolk Regimental Museum collections. First a Norman fortress, Ludlow Castle was improved upon for centuries and eventually became a royal palace. Originally, the fortification served to hold back the Welsh. Today, the castle is open for all to enjoy. Sitting high on a rock above the River Tees, the Barnard Castle is named for its founder, Bernard de Balliol. First built in the 12th century, the castle was later the property of Richard III. Visitors to the estate are able to enjoy the castle’s famed ‘sensory garden,’ which contains a variety of scented plants and tactile-rich objects. Less than 100 miles from London, the stately Warwick Castle is known for its superb medieval interior and great period re-enactments. In generations past, the families of Warwick were known for their lavish parties and jousting competitions. Some of the castle’s guests have included Edward the Price of Wales, he future King Edward VII, and the great Winston Churchill. Today, thousands are drawn to the castle to watch re-enacted jousting competitions that pay homage to Warwick’s medieval past. William the Conqueror first constructed the fortress on the site of an existing Roman fortification. Since that time, Lincoln Castle has remained a symbol of power throughout the ages. Today, the castle is on display and is the home site to an original 1215 Magna Carta. 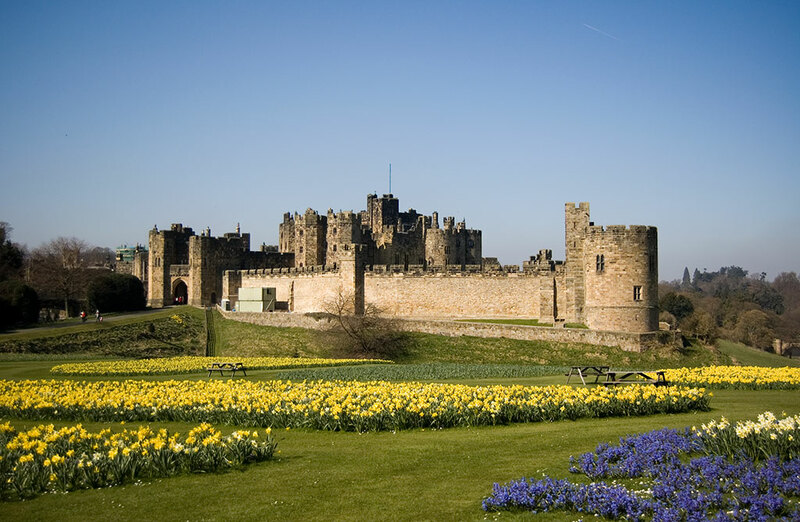 The stately home of the Duke of Northumberland, Alnwick Castle was first built following the Norman Conquest. However, the expansive home has been remodelled and renovated many times throughout the years, and is today often featured in films, shows, and popular entertainment. The castle was used as a stand in for Hogwarts School. Additionally, the castle has also been used as a location for feature films such as Robin hood: Prince of Thieves, The Black Adder, and Becket. Alnwick Castle was also used as the location for part of the filming of Downton Abbey. On the cliffs high above the Northumberland coastline, Bamburgh Castle extends nine acres across a rocky plateau and is one of the largest castles in England that is currently inhabited. Today, the awe-inspiring fortification sits on a throne of volcanic rock known as dolerite more than forty-five metres above sea level. With nearly 3,000 years of history, Scarborough Castle has proudly defended the country’s inlet area and has endured medieval sieges, Civil War, and German naval bombardment. 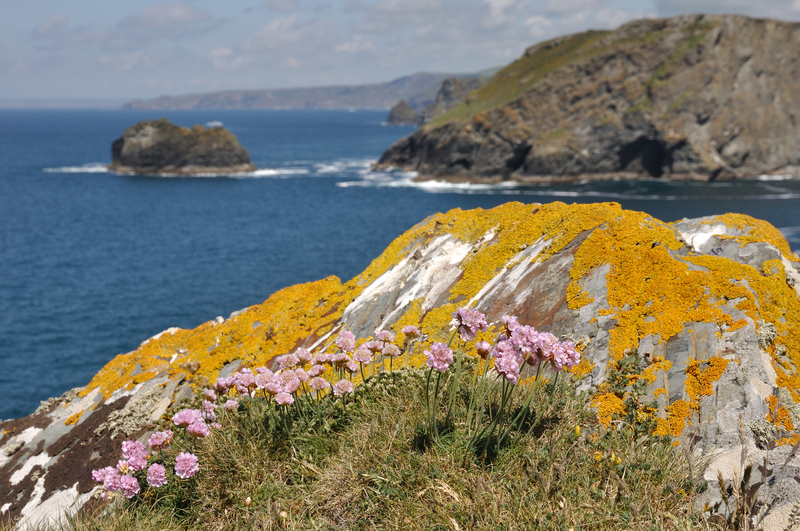 Today, visitors can climb the embankment and enjoy sweeping views of the dramatic coastline below.